Pediatric AKI has become a significant health concern due to its rising incidence and association with adverse outcomes. Because of the limitations of serum creatinine, ongoing research has evaluated multiple novel biomarkers for the early detection of AKI. Identifying biomarkers that precede changes in serum creatinine is vital, because these biomarkers provide opportunities to improve outcomes through early diagnosis and timely disease management. In this review, we discuss salient findings on 16 candidate biomarkers and their association with AKI. We explore the differences in biomarker distribution by age and discuss why adult biomarker research findings cannot be directly extrapolated to children. With future research, more consideration needs to be given to how the maturing kidney affects biomarker levels and how we interpret biomarker performance in children. A comprehensive approach using age-specific biomarker reference ranges is required to develop pediatric biomarkers and improve outcomes for children with kidney disease. AKI in children is associated with high inpatient mortality (1,2). Supportive care with optimizing hemodynamics and dialysis are currently the only treatments for AKI. Many AKI therapies have shown promising results in animals, but none of them have been effective in human clinical trials. One of the proposed explanations for this phenomenon is that the current diagnostic test for AKI, serum creatinine, is inaccurate. Serum creatinine can take days to peak after AKI onset and is not specific for intrinsic kidney injury, because it rises due to autoregulation and decreased glomerular filtration in states such as intravascular volume depletion, increased abdominal pressure, or poor cardiac function. Biomarker development has been recognized as a vital next step toward developing new AKI therapies in the field of pediatric nephrology (3). Novel biomarkers have the potential to not only diagnose AKI earlier than changes in serum creatinine, but also predict the development of AKI, differentiate the etiology of the AKI, and predict the likelihood of adverse post-AKI short- and long-term outcomes. The candidate biomarkers of AKI currently in focus have been tested in various pediatric cohorts, but additional research is needed to determine their use at different stages of growth and development throughout childhood. Many of the clinical biomarkers used in pediatrics have changing reference ranges on the basis of age. Examples include white blood cell count, hemoglobin, thyroxine, calcium, phosphorous, lactate dehydrogenase, uric acid, and aldosterone. In nephrology, protein-to-creatinine ratio, serum bicarbonate, and serum creatinine are among a number of clinical tests which use age-adjusted reference ranges. For example, a serum creatinine level of 0.7 mg/dl, although normal for an adolescent, would indicate abnormal kidney function for an infant. A protein-to-creatinine ratio of 0.3 mg/mg is abnormal for a 5-year-old, but normal for a 1-year-old (4). To date, there has been little emphasis on conducting AKI biomarker research specifically in children for developing age-adjusted reference ranges and threshold cutoffs. Recently, novel biomarkers of tubular injury were measured in a healthy population of children and found to have dramatic differences on the basis of age (5). Studying novel AKI biomarkers in a cohort of children without accounting for age-dependent reference ranges may result in inappropriate conclusions of biomarker performance. This age-related biomarker variability may partially explain why AKI biomarkers studied in children often appear to underperform in similar research in adult cohorts. Furthermore, original research on AKI biomarkers in pediatrics occurs less often than in adults (Figure 1). In this review, we will focus on the unique findings of AKI biomarker research in children and reinforce the notion that biomarker development in the field of pediatrics must espouse an age-focused approach. We use age-based cut-offs for common clinical tests in children—why not for novel AKI biomarkers? 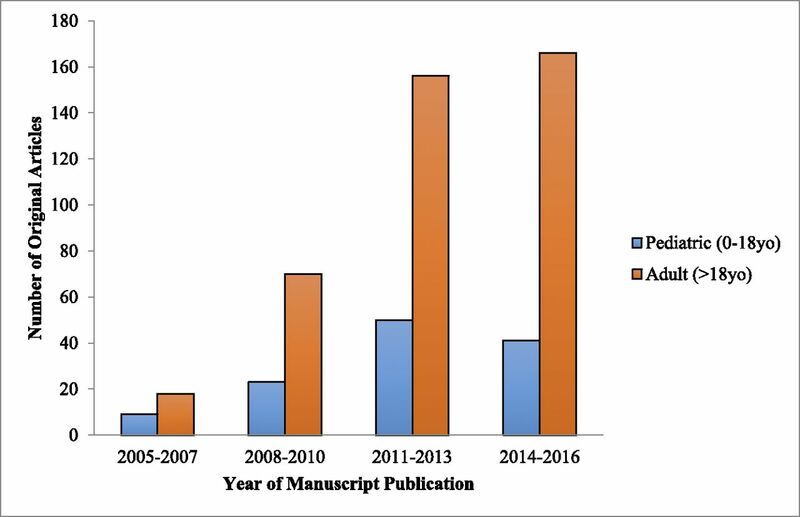 Original research manuscripts studying biomarkers of AKI are increasing over time but primarily focused on adult cohorts. The original manuscripts were identified using a PubMed search with the terms “biomarker” and “AKI.” The following filters were applied: humans, observational studies, clinical trials. To identify the pediatric studies, the filter “Child: birth-18 years” was applied. Publication dates January 1, 2005 through December 6, 2016 were included. Studies were included if they examined the association between a biomarker and AKI. Studies were excluded if they focused on one specific type of primary kidney disease (e.g., hemolytic uremic syndrome). yo, years old. Biomarker differences by age may be attributed to immunologic development as well as the maturing renal and tubular structure and function in children. Although nephrogenesis is complete by 36 weeks’ gestation, the kidney continues to undergo substantial changes postnatally. Neonates are born with a GFR of 10–30 ml/min per 1.73 m2 (6). Because of a dramatic increase in renal blood flow, a newborn’s GFR will double within the first 2 weeks of life and reach adult levels usually by 2 years of age (7). Tubular function, including urine concentrating ability, acidification of urine, and protein and electrolyte reabsorption, also continues to mature postnatally and reaches adult norms by 1–2 years of age (8). Baseline levels of urine biomarkers are often higher in premature neonates due to immature tubular transport mechanisms causing impaired reabsorption of proteins (9). Accordingly, any study of urine biomarkers in premature neonates must adjust for gestational age. The variability introduced by different rates and stages of kidney and immunologic development can add variability in observed data and thus obscure the assessment of biomarker performance. This may partially explain why in numerous studies we see inferior or variable biomarker performance in children versus in adults. Typically, a biomarker is developed in an adult cohort and then over time validated in children (10). It is not until validation studies in children that investigators identify an appropriate pediatric reference range, a process which typically lags many years (11). This process of simply extrapolating biomarkers developed in adults to children has the incorrect underlying assumption that adult and pediatric diseases are identical. There are unique causes of AKI in children such as perinatal asphyxia, neuroblastoma, and Wilms tumor which have unique mechanisms of injury and repair (10). More precise biomarkers of kidney injury relevant to these diseases will not be discovered relying on adult studies. Additionally, the pathophysiology of neonatal AKI is unique and can be affected by high renal vascular resistance, high plasma renin activity, ongoing tubular development, nephrogenesis, and low baseline GFR (12). More considerations in children include their ongoing growth, greater renal reserve, and superior renal regenerative potential compared with older adults with diminishing nephron mass (13). Finally, children have unique comorbidities, which may affect the course and management of their AKI such as bronchopulmonary dysplasia, patent ductus arteriosus, and necrotizing enterocolitis for which there are no adult equivalents. AKI is typically defined on the basis of the Acute Kidney Injury Network (AKIN) criteria where stage I AKI is a ≥50% increase in baseline serum creatinine, a ≥0.3 mg/dl increase in baseline serum creatinine, or urine output <0.5 cc/kg per hour for 6 hours. Stage II AKI is defined as at least a doubling of the serum creatinine from the baseline value or urine output <0.5 cc/kg per hour for 12 hours. Stage III AKI is at least a tripling of serum creatinine from the baseline value, urine output <0.3 cc/kg per hour for 24 hours, anuria for 12 hours, or patients who receive dialysis. Although a decrease in urine output is part of the AKIN criteria, most clinical research studies only use increases in serum creatinine to define AKI. Novel biomarkers of AKI appear imprecise when we compare them with an imperfect gold standard, serum creatinine (14). Because serum creatinine is a measure of glomerular function and not kidney damage, it is not an ideal biomarker of AKI. Serum creatinine often rises without intrinsic kidney injury and does not always rise with intrinsic kidney injury (15). To date, we have not yet identified a biomarker that satisfies all of the deficiencies of serum creatinine in the pediatric population. This is in part due to the multiplicity of pediatric AKI etiologies and the many biologic pathways implicated with kidney injury. There are also unique issues with using serum creatinine to define AKI in the pediatric population. For one, a newborn’s serum creatinine initially reflects maternal creatinine for the first few days of life. Subsequently, with normal kidney function, the serum creatinine will decline to a baseline level within 1–2 weeks in full-term and up to 6 weeks in preterm neonates (7). It can be challenging to interpret a neonate’s serum creatinine and diagnose AKI when their serum creatinine declines at varying rates. A proposed neonatal AKI classification defines the baseline serum creatinine as the lowest prior serum creatinine value (16). Thereafter, serum creatinine increases throughout childhood in proportion to the increase in muscle mass. Serum creatinine in children is also determined by a volume of distribution that varies throughout childhood (17). Additionally, younger children with normal kidney function may have baseline serum creatinine concentrations of 0.2–0.3 mg/dl, which is very close to the laboratory variability of 0.1–0.2 mg/dl (18). Therefore, an absolute increase in serum creatinine may reflect differing degrees of kidney dysfunction in children as compared with adults. To interpret the large percentage increases in serum creatinine seen in children with low baseline serum creatinine, it has been proposed that the serum creatinine must rise to at least 0.6 mg/dl to qualify as AKI (19). Biomarkers from the urine are an ideal target for detecting local kidney injury in children, especially because collection of the urine specimen is typically noninvasive. One issue with measuring biomarkers in the urine is the variability of water content or urinary concentration throughout the day. The most common method to correct for changing urinary concentration is to calculate the biomarker-to-creatinine ratio by dividing the urine biomarker by the urine creatinine. This is an effective method because there is a relatively constant excretion of creatinine into the urine (20). However, urine creatinine is produced by and directly correlated with muscle mass, and therefore is lower in infants and children than it is in adolescents and nonelderly adults (20). As a result, children will on average have lower urinary creatinine levels than adults. Adjusting biomarkers, such as urine albumin or urine protein, with urinary creatinine increases the biomarker-to-creatinine ratio more in children as compared with adults, thus making the comparisons of values between adults and children challenging. Prior research has identified a dramatic effect of age-related differences on AKI biomarker values in children. Bennett et al. (5) previously found that neutrophil gelatinase associated lipocalin (NGAL), L-type fatty acid binding protein (L-FABP), kidney injury molecule 1 (KIM-1), and IL-18 levels in healthy children displayed large and significant age-related differences. They found that urine NGAL was significantly higher in 10–14-year-olds (7.6 ng/ml;interquartile range [IQR], 3.3–21.7) and 15–18-year-olds (12.1 ng/ml; IQR, 6.4–27.0) as compared with 3–4-year-olds (3.6 ng/ml; IQR, 1.9–12.5) and 5–9-year-olds (4.5 ng/ml; IQR, 2.1–9.4) (P<0.001). KIM-1 was found to be higher in 15–17-year-olds (515.6 pg/ml; IQR, 195.2–866.0) compared with 3–4-year-olds (336.8 pg/ml; IQR, 195.2–513.1) and 5–9-year-olds (386.1 pg/ml; IQR, 217.7–620.4) (P=0.002). Finally, IL-18 was higher in 10–14-year-olds (25.4 pg/ml; IQR, 15.6–37.3) compared with 3–4-year-olds (18.7 pg/ml; IQR, 10.3–31.0) (P=0.03). Westhoff et al. (21) showed that the product of the urinary concentration of tissue inhibitor of metalloproteinases–2 (TIMP-2) and insulin-like growth factor–binding protein 7 (IGFBP-7) ([TIMP-2]×[IGFBP-7]) in healthy children 6–11 years of age was significantly higher compared with children <2 years of age (P<0.05). Albumin-to-creatinine ratio was also found to change with age. In 311 children enrolled before cardiac surgery, preoperative albumin-to-creatinine ratio was significantly higher in children below compared with above 2 years of age, in part due to lower urinary creatinine and lower tubular reabsorption of albumin in younger children (Figure 2) (22). In another study, the median urine NGAL concentration was found to be more than six times higher in healthy neonates (30.3 ng/ml; IQR, 5.2–137.4) compared with other infants and children (4.6 ng/ml; IQR, 0.2–146.7) (P<0.001) (23). Lastly, in a study on 81 premature neonates without AKI, with birth weights <1200 g or ≤31 weeks gestational age, levels of urine NGAL, albumin, uromodulin, and cystatin C measured within the first 4 days of life decreased with increasing gestational age, although KIM-1, β-2 microglobulin, and osteopontin did not significantly change with gestational age (9). This study found that median urine NGAL in neonates born preterm was 298 ng/ml (IQR, 194–640) at <26 weeks gestation, 276 ng/ml (IQR, 110–406) at 26–27 weeks gestation, 210 ng/ml (IQR, 139–559) at 28–29 weeks gestation, and 48 ng/ml (IQR, 33–211) at ≥30 weeks gestation (Figure 3). First postoperative albuminuria measurements and association with stage I AKI or higher differ by age. Urine albumin-to-creatinine ratio is displayed as milligrams of albumin per gram of creatinine. Optimal threshold value is the biomarker value to obtain maximal sensitivity and specificity. To convert to SI units (milligrams albumin per millimole creatinine), divide albumin-to-creatinine ratio by 8.84. Urine neutrophil gelatinase associated lipocalin (NGAL) changes with age in patients without kidney disease. Age-associated urine NGAL levels in premature neonates, full-term neonates, children, adolescents, and adults without kidney disease. NGAL levels were obtained from (5,9,23,46). GA, gestational age; IQR, interquartile range; yo, years old. Although serum creatinine–defined AKI (SCr-AKI) affects up to 20% of critically ill neonates and is associated with an increased risk of mortality, neonates are often excluded from many pediatric biomarker studies (24,25). Reasons for their exclusion include their rapidly changing neonatal physiology causing serum creatinine variability and thus making the diagnosis and severity classification of AKI challenging. The limitation of using serum creatinine concentrations in neonates underscores the importance of identifying new AKI biomarkers. 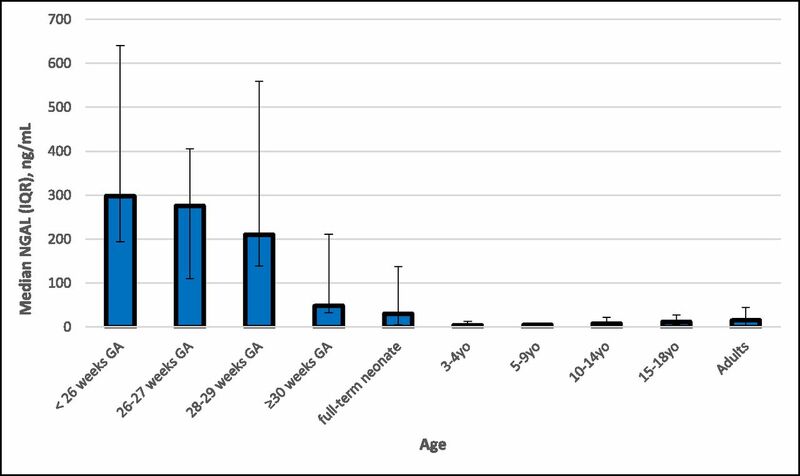 In one study, 12 urine biomarkers were measured daily for 4 days after birth in 113 premature neonates (birth weight ≤1200 g or <31 weeks gestation) (25). Neonates with AKI had higher peak levels of urine albumin, β-2 microglobulin, cystatin C, NGAL, uromodulin, osteopontin, α-glutathione-S-transferase, and vascular endothelial growth factor as compared with neonates without AKI. Urinary uromodulin had the best discriminative ability to diagnose SCr-AKI with an area under the curve (AUC) of 0.71. Epithelial growth factor and uromodulin levels in urine were significantly lower in neonates with SCr-AKI. KIM-1 was not associated with SCr-AKI. These urinary biomarkers measured in neonates were shown to vary significantly by gestational age. When corrected for gestational age, all biomarkers had improved discrimination for SCr-AKI except for α-glutathione-S-transferase. Because the variability in lean muscle mass can be substantial among very low birth weight neonates, adjustment for urine creatinine led to significant but modest improvements in biomarker performance. An additional study on 62 critically ill neonates found that both peak urine cystatin C and IL-18 during the first 10 days of life were associated with the subsequent development of SCr-AKI (26). Levels of urine cystatin C but not IL-18 were found to be inversely correlated with the gestational age. Several studies have evaluated the performance of AKI biomarkers in children, most commonly in the setting of cardiac surgery (27–36). Cardiac surgery cohorts are often chosen to study AKI because AKI is common, the baseline GFR is available, blood and urine are easily obtained before and after surgery, and the timing of the kidney injury is known. In one study, plasma IL-6 was measured in the Translational Research Investigating Biomarker Endpoints in AKI (TRIBE-AKI) pediatric cohort (30). The highest tertile of preoperative IL-6 was associated with SCr-AKI such that the children in the third tertile exhibited a six-fold increased risk of stage II AKI (adjusted odds ratio [OR], 6.41; 95% confidence interval [95% CI], 1.16 to 35.35). Although the interaction between IL-6 and age was not examined within this pediatric cohort, the third tertile of preoperative IL-6 was not associated with SCr-AKI in adult studies (37). In another study from the TRIBE-AKI pediatric cohort, higher levels of preoperative creatine kinase–MB (CK-MB) and heart-type fatty acid binding protein (h-FABP) were significantly associated with increased risk of stage I AKI (CK-MB: adjusted OR, 4.58; 95% CI, 1.56 to 13.41; h-FABP: adjusted OR, 2.76; 95% CI, 1.27 to 6.03) after adjustment for demographic and clinical variables (29). CK-MB and h-FABP were also studied in two adult cardiac surgery cohorts and only preoperative h-FABP levels were similarly found to be associated with stage I AKI, but the distributions of biomarker levels were remarkably different when compared with children (38–40). The results of these studies suggest that the preoperative biomarkers, IL-6, CK-MB, and h-FABP, have significant and unique associations with postoperative AKI in children and can be measured before surgery to assess the postoperative risk for SCr-AKI. Discovery proteomic studies and preclinical models have identified proteins indicative of tubular injury (IL-18, NGAL, KIM-1, L-FABP, TIMP-2, IGFBP-7) as postoperative biomarkers of AKI. Some of the earliest human data on urine NGAL was studied in children in a perioperative setting (41). Subsequent pediatric studies have confirmed that after cardiac surgery multiple novel biomarkers can diagnose AKI earlier than serum creatinine. In a study on 220 children prospectively enrolled before cardiopulmonary bypass, IL-18, L-FABP, KIM-1, and NGAL were measured at 2, 6, 12, and 24 hours after surgery. IL-18, L-FABP, and NGAL peaked within the first 6 hours after surgery, preceding serum creatinine, which peaks 24–48 hours postoperatively. Children who developed SCr-AKI were significantly younger as compared with those without SCr-AKI (0.6 years; IQR, 0.4–1.8; versus 3.3 years; IQR, 0.5–6.0) (33). The postoperative urinary biomarkers (NGAL at 2, 6, 12, 24 hours; IL-18 and L-FABP at 6, 12, 24 hours; and KIM-1 at 12, 24 hours) were all associated with stage I AKI after cardiac surgery. All four biomarkers also had significant inverse correlations with age (33). Urine NGAL at 2 hours after surgery was determined to have excellent discrimination as a diagnostic test for SCr-AKI in both neonates and non-neonates with AUCs of 0.95 and 0.92, respectively (35). In contrast, the optimal threshold cutoff for urine NGAL to diagnose SCr-AKI at 2 hours after surgery was determined to be different on the basis of age; 185 ng/ml in neonates and 50 ng/ml in non-neonates. Urinary NGAL, IL-18, KIM-1, and L-FABP were also studied in the TRIBE-AKI pediatric cardiac surgery cohort. Compared with NGAL, KIM-1, and L-FABP, the fifth quintile of first postoperative urine IL-18, measured within 6 hours of surgery, was found to have the strongest association with stage II AKI compared with the first quintile (adjusted OR, 6.9; 95% CI, 1.7 to 28.8). The study found a higher discrimination for stage II and III AKI by using urine IL-18, urine NGAL, and plasma NGAL in children >2 years old (AUCs: 0.75, 0.77, 0.70) compared with using these same biomarkers in children ≤2 years old (AUCs: 0.66, 0.65, 0.52). Because children ≤2 years old comprised 51% of the TRIBE-AKI pediatric cohort, the results in these youngest children lowered the AKI discrimination of the kidney injury biomarkers when the whole cohort was analyzed together without regard to age. There were also large differences in biomarker distribution or association with SCr-AKI when comparing pediatric to adult results in the TRIBE-AKI study. The first postoperative IL-18 in children displayed a similar association with SCr-AKI but a different distribution, when compared with adults, whereas KIM-1 showed a similar distribution but a different association with SCr-AKI (Figure 4). As such, postoperative biomarker levels were often very different in children versus adults. The median urine L-FABP on postoperative day 1 was 366.0 ng/ml (IQR, 58.1–400.0) in SCr-AKI pediatric patients and 69.1 ng/ml (IQR, 19.9–257.2) in non-AKI pediatric patients (27). This is in direct contrast to adults with lower urine L-FABP levels of 66.3 (IQR, 6.7–400.0 ng/ml) in SCr-AKI patients versus 18.4 (IQR, 4.2–100.9 ng/ml) in non-AKI patients (27,42). Urine TIMP-2 and IGFBP-7 were studied in both pediatric and adult cardiac surgery cohorts and had different biomarker distributions but similar discrimination for SCr-AKI, with an AUC of 0.85 in children and 0.84 in adults (43,44). Urine (TIMP-2)×(IGFBP-7) was found to be higher in children as compared with adults before cardiac surgery (43). Interestingly, unlike the adult cohort, (TIMP-2)×(IGFBP-7) levels significantly decreased after cardiac surgery in children without AKI, and thus the optimal threshold cutoff in children to diagnose SCr-AKI at 4 hours after surgery was 0.7 (ng/ml)2/1000, which is less than the preoperative level of 1.0 (ng/ml)2/1000. The optimal (TIMP-2)×(IGFBP-7) cutoff threshold in the adult cardiac surgery cohort was 0.5 (ng/ml)2/1000, higher than the Food and Drug Administration–approved cutoff for adults of 0.3. These findings reinforce the no-tion that adult research cannot simply be extrapolated to children and that biomarker development in pediatrics must be age-specific. First postoperative urine IL-18 and KIM-1 collected 0–6 hours after cardiac surgery differs between children and adults. (A) Comparing children to adults, IL-18 shows a similar association with AKI but different distribution and biomarker cutoffs. (B) KIM-1 shows a similar control distribution but a different association with AKI. AKI was defined by receipt of acute dialysis or a doubling in serum creatinine from the preoperative serum creatinine value (stage II AKI). Sample collection protocols and biomarker assays were similar in adults and children. KIM-1, kidney injury molecule 1; 95% CI, 95% confidence interval. The importance of identifying novel biomarkers of AKI is compelling due to the morbidity associated with AKI as well as the lack of therapeutic options, especially in vulnerable pediatric populations. Despite extensive efforts to better phenotype AKI in children using multiple novel AKI biomarkers, none of these biomarkers are routinely used in clinical practice or in AKI trials. One of the reasons for suboptimal biomarker performance could be that prior research in children has rarely accounted for age when interpreting biomarker levels, despite significant variability in these levels on the basis of age. These results highlight the influence of growth and development on renal physiology as well as the importance of original research and validation studies in children. Pediatricians recognize that different approaches are required across the age continuum, although a personalized and age-appropriate approach isn’t always translated to pediatric research. We need to incorporate our understanding of kidney maturation into future research, and account for age-associated differences when interpreting AKI biomarker levels. 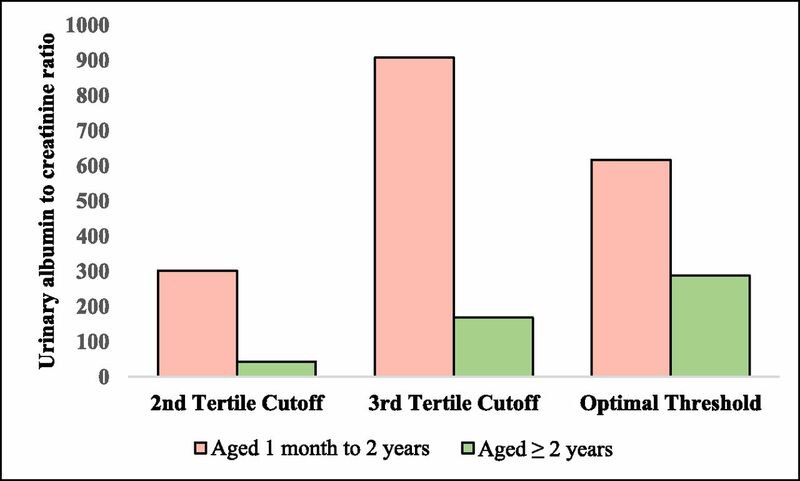 An initial approach could involve adjusting biomarker values for age or stratifying all biomarker analyses by <1 month of age, 1 month to 2 years of age, and >2 years of age, because these are common age cutoffs for maturation of kidney function. We also need to study how age affects biomarker performance for children in the nonperioperative setting. Although there has been prior AKI biomarker research in this patient population, most studies did not perform subgroup analyses by age. Future clinical trials in children that use novel biomarkers will ultimately determine their usefulness and their effect on clinically meaningful outcomes. This study was supported by the National Institutes of Health (NIH) (R01HL085757 to C.R.P.) to fund the Translational Research Investigating Biomarker Endpoints in AKI Consortium to study novel biomarkers of AKI in cardiac surgery. J.H.G. is supported by the National Institute of Diabetes and Digestive and Kidney Diseases of the NIH under award number K08DK110536. C.R.P. is supported by the NIH (K24DK090203) and P30 DK079310-07 O’Brien Center Grant. C.R.P. is also a member of the NIH-sponsored Access, Serial Evaluation, and Subsequent Sequelae in Acute Kidney Injury Consortium (U01DK082185).